If you like this free game, try Easy Checkers. 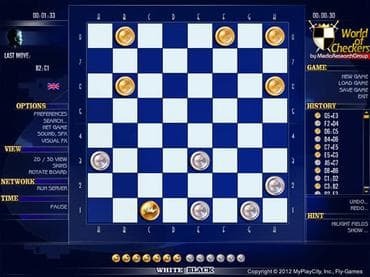 World of Checkers is classic board game which has some similarities with chess. The aim is to capture all the pieces of their other player, or make them unable to move any further. Play against the computer AI or with your friend locally. World of Checkers has the English, Russian and Giveaway play style rules. Choose between three difficulty levels when playing against the computer. Options to undo or redo moves and save your progress. World of Checkers also has a hint system for beginners and you are able to choose between 2D and 3D board layouts. If you have questions about World of Checkers game, please contact us using this form.